I suppose it's typical. I've tried to get in on the Berlin Marathon ballot twice, and have failed both times. First time I tried the Chicago ballot, I failed. I then entered again for this 2018, and got in - I was incredibly pleased. 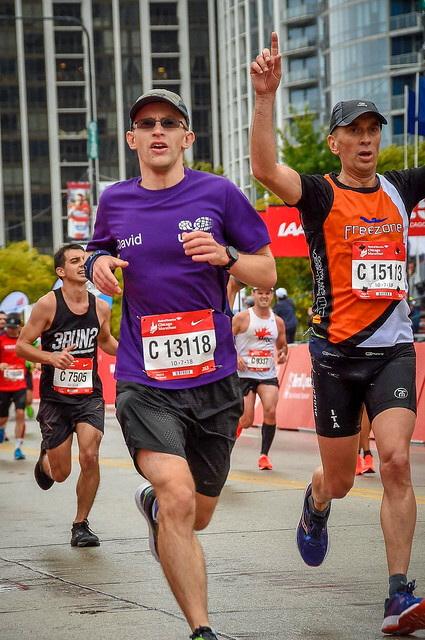 This would be my second World Marathon Major after having done London in 2015. The slightly amusing thing is that after finally getting in on the ballot I was able to achieve a ‘Good For Age’ time for this event whilst racing the Greater Manchester Marathon. I have to admit, I hadn't actually realised it was a Chicago GFA time at first - I usually think more of London and Boston, but Chicago actually has the most lenient of qualifying times. So, Manchester changed things. Knowing Chicago is a fast course meant I now wanted to find a way to fit in the training required to get a London, or even a Boston GFA time. Of course I knew I wouldn't get the time I needed for either, but going after it would at least mean I stood a chance of taking a step in the right direction. If you don't try, you can't succeed. After my first marathon of the year, I tried to keep my legs going until Malawi. Once that was done and dusted I knew my focus had to be on getting long runs done, and picking up some speed work. It's difficult though when during the peak of training you know you'll be away for two weeks with little opportunity to run. Despite the challenges, and a lot of failed runs over the summer - I somehow got a new 10K PB towards the end. Not just once, but twice. I didn't think this could possibly translate to doing better at marathon distance, but I had to try. If I could get sub-3:30, then although not what I'd originally hoped for, I would at least be happy. Ideally though, I wanted 3:10. I think having got my sub-90 minute PB for a half marathon a week before may have made that all the more harder - my legs wouldn’t be as rested. 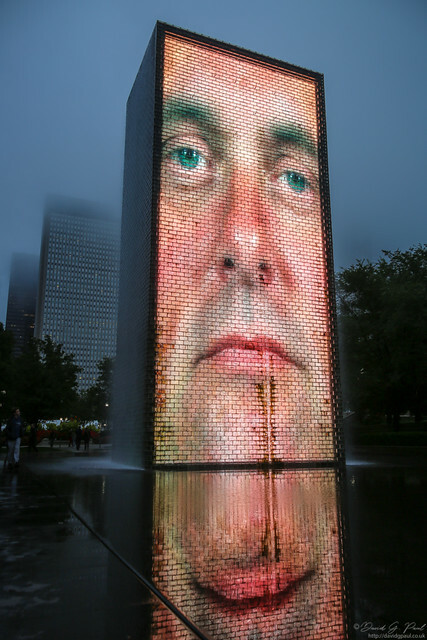 Especially with the amount of walking they’d done around Chicago for the sake of tourism. With a race start at 07:30 I had to make sure I was in the athletes village long before that. I’d spoken to the reception the day before and had borrowed a kettle from them so I could make a cup of tea early - I was up at 04:00. Too early - it wasn’t a great time to find out the kettle didn’t work. 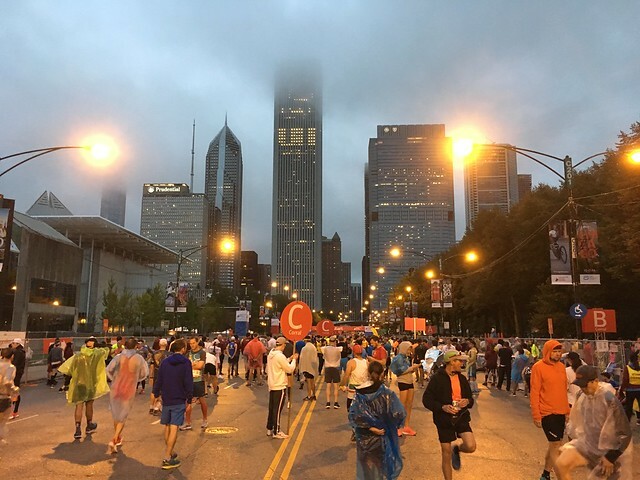 I took my time, and eventually left the hotel just after 06:00 - I’d be out in the rain from then until after I’d finished the race so wanted to find a balance between getting to the start on time, and not getting too wet before I’d started. I did have a poncho with me though, so I could at least start with that. It was a one mile warm-up run from the hotel to the park, though I had to stop frequently for crossing roads. By the time I reached Grant Park the rain had started to ease, but I kept my poncho on just in case - it’d keep the wind off me anyway. I made my way to the ‘C’ pen, and stood around with the other runners waiting for the start. Overhead a helicopter was doing laps close to the skyscrapers, getting close but not touching them. Before anyone could start there was the American National Anthem; sung so pitchy that I couldn’t help but wince in places. They introduced the wheelchair racers, including Team GB legend David Weir. They were off ten minutes before introducing the elite field for the main race which included Sir Mo Farah, and Florence Kiplogat to name but two. I couldn’t see them, as even in ‘C’ I was too far away, but it made me smile to know such legendary runners would be somewhere far, far ahead of me on this course. It took around three minutes before I’d cross the start line. When the race started I paid no attention to pace to start with - I figured I’d start with what felt easy to let my legs wake up a little. It’d accidentally worked for Robin Hood Half, so maybe it was a good idea to try it for a longer race. I couldn’t really trust my watch at this point as fairly quickly we were going through an underpass which was affecting what my watch was reporting at the pace. I had to trust my legs to do the right thing. After crossing the Chicago River for the first time, the first mile had now ticked by. This bridge was a little slippery so had to slow down and be careful until I reached some mats that had been taped down over it. During the second mile I was still getting a terrible GPS signal, so again had to guess - this time I didn’t get it right as I’d sped up to 6:40/mi. I think it’s difficult to judge when you’ve got long straights. I think maybe it was downhill a little too. It was spitting with rain, but the crowd support was incredible with the usual American cheers. A couple in front of me were commenting how it’s better supported than New York - I was thinking the same about London or Manchester. I don’t know any UK race supported as well as this one. Later in the race I did start to notice though that some spectators would chant “USA! USA! USA!” whenever a foreign runner, particularly Mexicans, passed them. At least it was only a minority that did that - one American spectator countered the chants with “Wooo! Go Mexico!”. There was such a variety of signs too - ones such as “You’re running better than our government”, and more negative ones such as “You’re the slowest runner so far” (though this was not the worst). That last one is of course true: it would have applied to Mo Farah who won the race, and everyone behind as we passed by the spectator one by one. At 5K I figured I’d done it in about 22 minutes, so doubled it in my head and then doubled it a couple more times. I figured if I could hold the pace until the end, which was unlikely, it’d sub-3:10. That encouraged me a little, though by mile 4 I realised I needed to pee. There was no chance I was going to be able to wait until the finish, and I’d just passed one set of portaloos. Reluctantly I decided to keep going until I next spotted some. 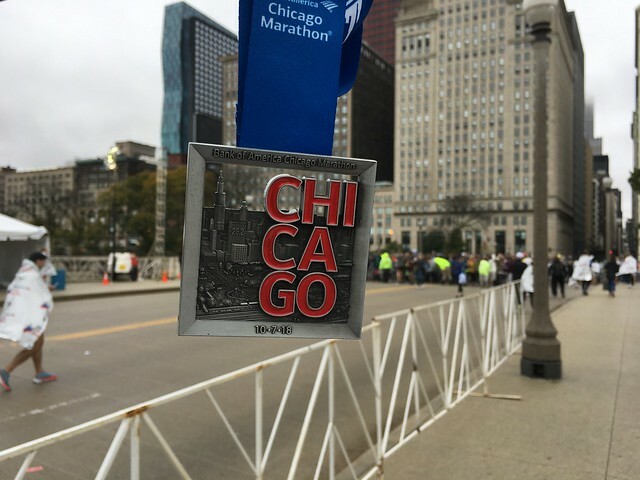 The course had been continuing north for quite some time, it wasn’t until we’d passed the Lincoln Park Zoo, exited the park it was in and was about to reach mile 8 that the route finally turned left, and then left again to begin the long journey back to downtown Chicago. Needing a portaloo seemed to have an impact on my pace - despite it feeling like I was going slower, I was in fact for the most part going faster than I had been. I was frequently hitting sub-7:00/mi which isn’t my ideal pace for a marathon - it’s too quick at the minute. Each water station we passed had a long stretch of gatorade cups, and then a long stretch of water. I’d hit 10 miles so far and hadn’t used any jelly babies, or had any water - I didn’t want to risk it until I’d found a portaloo. At 10.2 miles into the race I finally found one, was quick, and then got back out - still in front of the sub-3:10 pacers I’d passed early on. I wasn’t entirely sure I had, but I had a rough idea how far ahead I was and how long I’d got to spare. The pacers weren’t that noticeable though as they had a stick to hold in their hand with the number printed on, but none of the pacers I encountered would hold it in the air - who would for 26.2 miles?! I felt much better, and had only lost about twenty seconds during that mile split - I found myself getting back up to speed fairly quickly and recovering ten of those seconds in the next mile. It’d been a while since I’d taken in any of my surroundings - we’d been passing through residential areas and some small business areas, but there hadn’t really been anything of note. One thing I did spot, although couldn’t see anything that looked old, was a sign on either side of the road saying ‘Old Town’. Not long after this we crossed the Chicago River once more to run through downtown Chicago again, and hitting the halfway point - though this time we were running straight through and going out of the south side. At the halfway point I was at 1:32:55. I wasn’t sure of the precise time when I was running, but I was starting to feel hopeful that I was going to get close to 3:05. I had seen someone running with that time on their back, but I didn’t think they were a pacer. I just needed to hold this pace, and at the time it felt like I could. I’d adopted a strategy of slowing down for the first part of each mile, and would then allow my pace to creep up over time. It was working well, and was actually feeling quite fresh. Since mile 10 I’d even used a few jelly babies, and had a quick sip of water so I figured fuelling would be okay too. It was nice to recognise some parts of the city from my excessive tourism of the place over the last few days too. The tall buildings however, weren’t helping my GPS… again. My watch had no idea what pace I was doing, so I was still guessing on what felt right - and then estimated how I was doing when I reached a mile or kilometre sign with a time above it. Not the best method of measuring speed, but it’d do. When we got nearer to some railway tracks to the west of the city, the rain started to get heavier. There were now big spots on my glasses, and my t-shirt was saturated and clinging to me - making it uncomfortably tight across my chest. I tried a couple of times to pull it away, but the weight of the water just drove it back to where it came from. I couldn’t even wring any water out of it as it was getting wet just as quickly. I resigned myself to put up with it, but my clothes felt heavy. We passed through Greek Town, and didn’t turn back until we’d gone around the perimeter of the Malcolm X College. I’d had a few miles where I’d walked for longer than intended, but after this I surprised myself and ran a few more miles without walking - I’d found a rhythm in slowing down and speeding up once more. Perhaps this was it - I was at mile 22 and felt like maybe I could now run all the way to the finish. It wasn’t to be though - after China Town I found myself needing to walk again; but as I did so the soul-crushing horde that accompanied the 3:10 pacer charged through. I admit pacers are useful; but I tend to keep an eye on where they are in a race not just so I know how I’m doing, but to make sure their horde is not suddenly going to be in the way. It didn’t matter though - I now knew I wouldn’t get a 3:10 as I didn’t feel I could go at the pace they came through out. I did try though, briefly, and even overtook them again for a while. I just couldn’t keep it going though. I think mentally the race was over for me now, and I just needed to finish. After that I was doing slower than 8:00/mi. Eventually the 3:15 pacer passed me with just over a mile to go. I could see the skyscrapers ahead of me - they were feeling close. I felt like I wanted to run every step that was left, but I just couldn’t do it. Even with only 300 metres to go I was walking up the ramp that leads into Grant Park. Then that was it - I decided to sprint the remaining distance, and crossed the line of my second World Marathon Major. It didn’t feel like an achievement, but I was glad to have done it. In the back of my mind I was thinking it'd be good to do it again, though with the expense of this trip I think perhaps it better to try other international races first. I finished in 3:15:13 in position 2,989 of around 55,621 runners. I suppose I should be pleased with that. During the exit funnel they’ll first hand you a bottle of water, and what seemed to be a hundred metres further along they were handing out the medals. They then handed out foil wraps to keep you warm in the rain, a banana and apple (which I ate straight away), and then a bag filled with various bits such as pretzels and protein bars. It took quite a while to get out of the park, but when I did I headed straight to Subway to get a 6” steak and cheese sub. Unfortunately they were quite useless in there as not only did they not scan my card like I’d asked them to and then apologised it was too late, but they kept getting my order wrong too. Is the Leicester accent that hard to understand? It wasn’t the most pleasant of walks back to the hotel, but after a long soak in a scalding hot bath I was ready to head back out into the city for some last minute tourism… as long as the rain would hold off. Luck was with me this time - it didn’t rain between me leaving the hotel and getting back a few hours later. 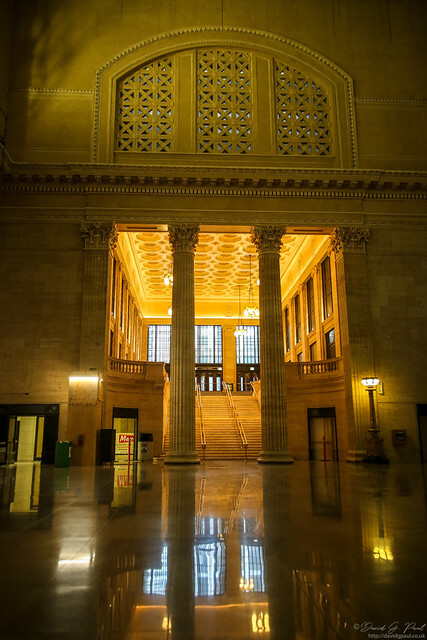 I started with Union Station which is west of the hotel, and took a few photographs inside and out, before continuing north towards the Holy Name Cathedral. Occasionally I passed other runners who had completed the race also, and passed some locals who congratulated me on the race. It reminded me a little of travelling across London after the marathon in 2015. The Holy Name Cathedral only needed a few photos on passing - I couldn’t go in due to there being a service. I carried on from there to the Historic Water Tower which was one of the few buildings to survive the Great Chicago Fire of 1871. I guess it being a water tower had something to do with it. From this spot I could also see the John Hancock building mostly hidden by cloud, so turned around and headed back towards the skyscrapers. On my way to Giordano’s to collect my pizza, I spotted the Nike store so thought I’d have a look around to see what marathon merchandise they had. As I entered, and as anyone with a finishers medal entered, the staff would all cheer. I looked at the t-shirts they had, but sadly they and most of their other clothing items had sold out of ‘small’. They did however offer medal engraving on the fourth floor - fortunate that the aches in my legs had worn off. Unfortunately after fifteen minutes of queuing I found I’d need to collect my medal in the morning - so due to my early flight I couldn’t have it engraved. Oh well, pizza awaited me. This was what the map said would be a thirty minute walk away, but even with tired legs from the marathon I was far quicker than what it said. It had been a good job I’d ordered on online as when I arrived I heard there was a ninety minute wait on pizzas due to how popular they were after the race. 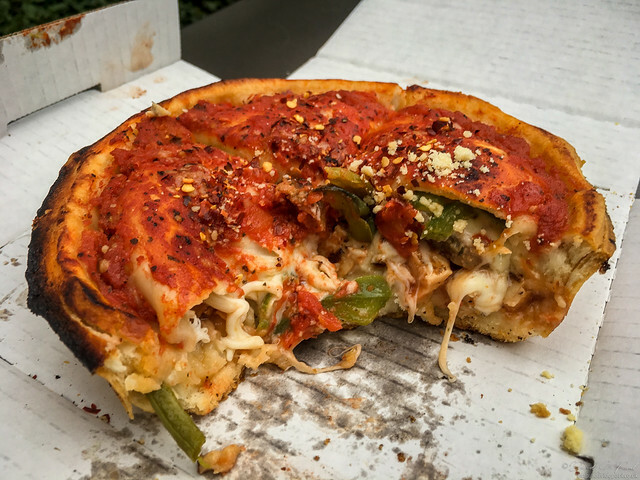 Of all the foods in Chicago, a deep dish pizza was the only thing I really wanted to try. I’d ordered online an individual sized one which was custom made to have the toppings I wanted: BBQ chicken, sausage, and green peppers. It included sachets of red pepper and parmesan as well so I could add however much I wanted. Rather than sit outside the restaurant, I continued my walking, and sat by the Millennium Monument which is located by the Cloud Gate. It was a tasty pizza - far better than I was expecting. In some ways I’d liken it to a pie or a quiche, or something like that; but pizza tasting. Once I’d done I took some more photographs of the Cloud Gate before making my way back to the hotel via a few shops. It’d been a long day, and I’d covered over thirty miles on foot by the end of it. Hopefully the miles I’d done in the afternoon would benefit me more than cause further aches. I could at least relax for the remainder of the day - once I’d packed for my flight.